The new oval shaped canopy found on Galtech's 8' x 11' wood outdoor umbrella will provide the perfect shade for your larger sized tables. Raise and lower the umbrella with the convenienct quad pulley system. The premium dark wood finish adds a deep and rich beauty while the resin hubs and runner add durability and it is all topped off with six coats of marine grade varnish to seal the finish and provide years of enjoyment. Choose from a wide variety of colorful fabrics that are sure to coordinate beautifully with your outdoor decor. 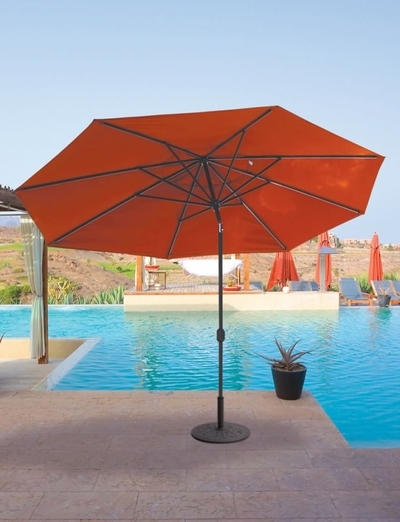 Take the time and relax, in sun or shade, with this opulent patio umbrella that has refinement, sophistication and style. * Shade Size: 8' x 11' ft.